Welcome to the month of July! Wow, summer is here. July is a very exciting month for me. I’m just days away from leaving for Washington, DC for our annual convention! It’s my first time and so I’m over-the-moon that I get to go this year. My next post will be from convention … I hope. Oh, and if you’re here before 9am eastern time on the 1st, you can still order the Big Goodie Box that is full of 58% discounted items. Just click on the Jackpot image on the right. Enough about that, on to this adorable stamp set! This month we have almost 70 consultants participating! If you came from Carol’s blog, you’re in the right spot. If this is your first stop, just keep hopping until you get back here and you’ll have seen every beautiful piece of artwork. Have you ever seen cuter little hedgehogs? I love these little sweeties. It was fun coming up with the perfect project for this hop. I really wanted to try my hand at the easel cards I keep seeing everywhere. I’m quite pleased with how mine turned out. I used the Twitterpated Level 2 paper pack. I paper pieced the kite and little butterflies, and spnged the edges of everything with chocolate ink. I chose not to colour in the hedgehog, letting the little bow by her ear pull the eye. The ribbons are from the Sorbet and Chocolate Ribbon Rounds collections. I think this just might be my daughter’s birthday card next year … but can I wait that long to use it to make someone smile? We’ll see. Ready to see more artwork? Just hop on over to Judy’s blog and check it out. If you get lost along the way, just click here to go to Kathleen’s blog where there is a complete list of all the participating blogs. Oh so cute! I love the bow! Your card is great. 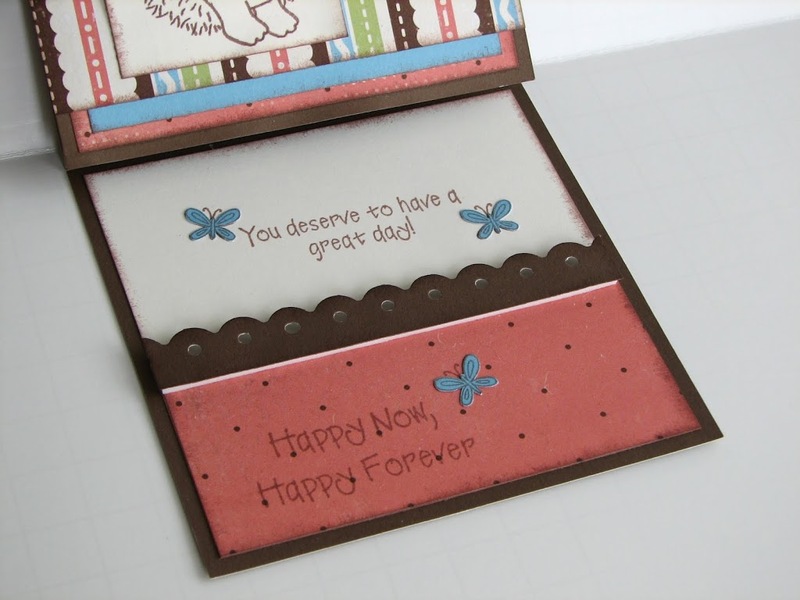 These easel cards are kind of new to me, It’s great to see such a pretty example completed like you did. Thank you for sharing! Love your easel card!! Well done! Yay! You finally made an easel card! Great job Krista! I love it! Love your card! The easel card is on my list to try soon! Hope to meet you at Convention! Fabulous easel card! That little bow in the hedgie’s hair is adorable. This is an absolutely darling card! You did a great job! 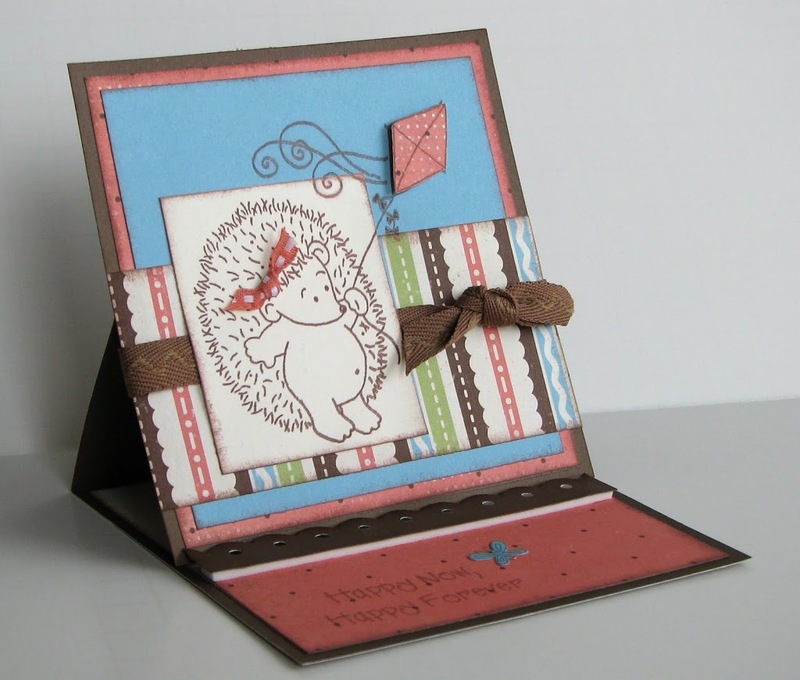 Love the easel card, and that bow in the hedgehog’s hair is super sweet! CUTE little ribbon in “her” hair!!! love it! Adorable! Love that color combination and such wonderful attention to detail…especially that precious bow! Super work! I love your card. It is so adorable. I need to make an easel card soon. Love all of the fabulous details on your easel card! I can’t pick what my favorite part of it is – just the whole thing! really cute. I love how you stamped the hedgehog but didn’t colour it, then put the bow on. SO cute. The card is really sweet! I’ve never seen this before! Really nice card… I will have to give it a try! Way to go making it a girl! love the bow!